While the whole dinner process can be a little stressful at times (i.e. figuring out what to cook, shopping for the groceries, and actually throwing it all together to create a balanced meal), cooking for my family and friends is one of the things I enjoy most. 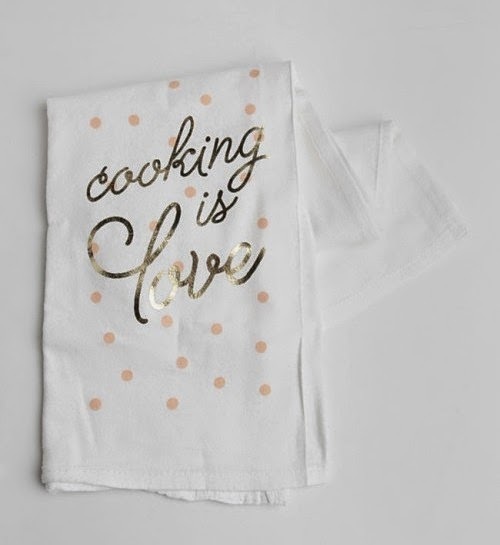 Needless to say I was immediately drawn to this sweet little tea towel because preparing and sharing a meal with my loved ones is exactly how I express to them how much I care. I love the idea of keeping a basket of fresh-from-the-oven scones warm under this towel for a relaxed brunch at home, or resting a hot casserole dish on top of it. Plus, the polka dots and gold lettering are really cute and girly, no? Awww-- what a sweet towel! And I do agree the gold lettering is fantastic!